Is storing data within an ID image a leap forward for picture ID badges? A unique new barcode technology combines the data encryption of barcodes with the usefulness of a picture. The product, developed by Complete Inspection Systems, is named 'HD Barcode'. The resulting data encoded image can be used as a method of dual authetication or anti-counterfeiting measure for picture ID badges. An encrypted barcode can contain significantly more information than a standard access control credential, up to 5.677 million bits of information. Considering that many access control badges contain variations between 26 and 37 bits per card, this capacity increase allows many more fields of data to be contained on a card. Information beyond simple ID numbers can be stored, and more detail describing the individual, (e.g. physical attributes, security clearances, and scheduled permissions) can be included as part of the image itself. Data is stored on the barcode as an ASCII string, plus a binary 'blob'. The developer says this binary 'blob' may "contrain any type of data object object" with no format limit "on the size of the string, or size of the 'blob' ", as long as it falls within the overall storage capacity. Larger or higher resolution codes require more 'read' time (or require a faster reader 'refresh' rate). Encryption of stored data uses a proprietary format, but the binary data can be configured to match an existing standard by using the 'ASCII Blob' component. The technology has been optimized for being quickly read by cell phones, but the image quality and data encoding can be tweaked for specific applications. For high resolution codes, the manufacturer states that "a wide range of scanning devices can be used" for specialized applications like identity verification. Because this technology is new, and the developer has primarily focused this product for the product labeling industry, HD Barcoding has been optimized for quick reading by smartphones, not for displaying the high quality ID images required by security. The result of encoding high resolution images and data together can result in a 'busy' image. The larger amounts of data an image contains, the more 'noisy' the image will appear. 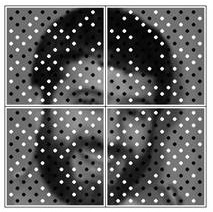 Users may determine the image quality insufficent to outright replace high resolution ID pictures. 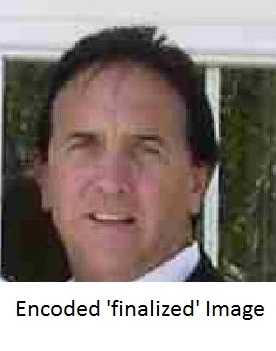 For large data sets, the encoded image might be applied in a manner similar to a 'watermark' or secondary image on a picture ID badge. For the technology to have impact in the physcial security market, the underlying encoded image quality will need to be improved. HD Barcode is a new product, but the developer anticipates selling the technology via a 'black box' appliance that accompanies card printers. The 'black box' will be good for a specific number of codes, and extras like cell phone apps, code readers, or custom modifications will be additional costs. Final pricing is subject to many variables, but the developer suggests that the initial customization cost of $15,000 to $25,000 USD can be expected. With that, the user will have barcode class unique to the client. 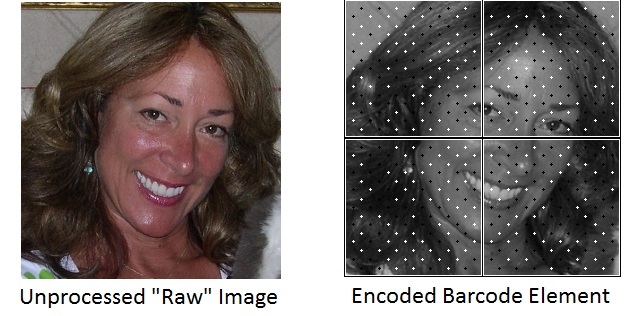 For physical security, encoded images could be printed or displayed in a number of ways. Instead of requiring a 'smartcard' with an embedded chip to store data, the image would be printed to contain the same information. The entire data set could then be transmitted electronically (via email, flash memory) and displayed on mobile technology like smart phones or tablets. For example, in a high security facility, a person passing through a checkpoint would be asked to display an encoded photo ID image. After confirming a match, the guard would scan the image to confirm that proper access levels are granted for entry. The photo ID itself could be printed on paper, plastic badge or be an image on a cellphone. In order to be sucessful in security applications, this technology needs to be optimized to provide visual clarity of the image even if it means giving up data capacity of the barcode. We expect that with further refinement and development, the utility of storing encoded data within an image would be an important addition to traditional photo ID badge systems.